If you like Middle Eastern-style kibbe, you're sure to enjoy its Turkish counterpart. It is called içli köfte (eech-LEE' koof-TAY), which means "filled meatball." It's a dish that is common in the southeastern regional cuisine of Turkey where many Middle Eastern influences are present. They are especially famous in the city of Kilis. These meatballs are usually served as a hot appetizer or meze before a meal of spicy kebabs. 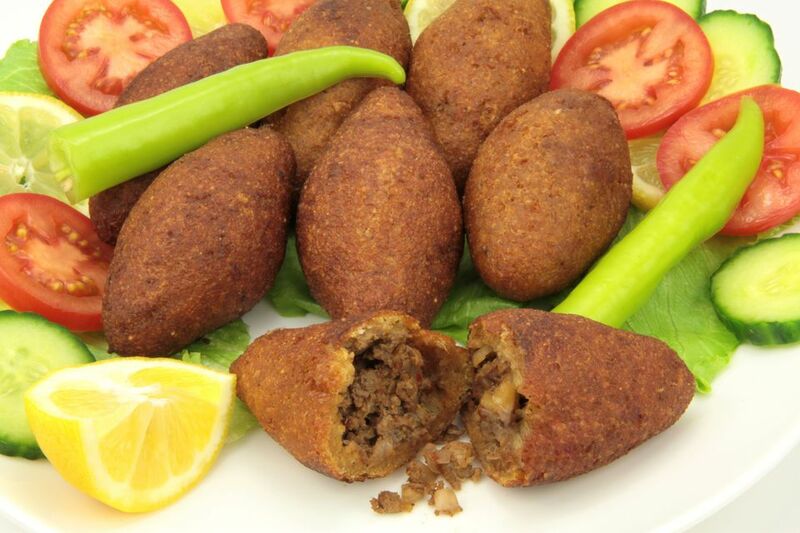 Balls of dough made from a mix of fine bulgur, potato, and spices are used as the outer shell. Favorite fillings include ground beef or lamb combined with ground nuts like pistachios, walnuts, or pine nuts along with spices. They're then fried to perfection. It's actually easier than it seems at first, especially once you get the hang of rolling and stuffing. You can find stuffed meatballs on the list of appetizers in most meat and kebab restaurants and as a hot finger food at home parties. The best meatballs have a soft but crispy shell, with juicy, steaming filling in the middle. Note: while there are multiple steps to this recipe, this koftka dish is broken down into workable categories to help you better plan for preparation and cooking. In a small skillet, fry 1/4 pound ground beef until just cooked. Add the onion and continue to stir until the onion softens. Add the ground nuts, salt, black pepper, paprika, and hot red pepper flakes and continue to sauté. When all the flavors have combined, remove the pan from the heat and let it rest. In a large mixing bowl, combine the bulgur, ground beef, black pepper, salt, potato, egg, and onion. Knead together for several minutes to form a dough. Break off walnut-size pieces of the dough and roll them into balls. With your index finger, push some of the meat and nut filling into the center of the dough and close the end. Shape the meatballs to be narrower at the ends and thicker in the middle in a kind of spindle or football shape. In a large skillet, heat a generous amount of sunflower oil. Fry the meatballs evenly on all sides until dark golden-brown. Place on paper towels to drain. Serve piping hot. Garnish with fresh Italian parsley and serve with a dipping sauce of plain yogurt mixed with grated cucumber and fresh dill.